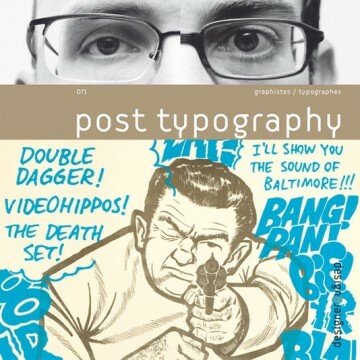 Design & Designer 071 – Post Typography, official blurb: Nolen Strals and Bruce Willen, who founded the Post Typography studio in Baltimore in 2001, are inveterate media-mixers. They wed illustrations with photos, transform mundane objects into alphabet letters, and give 2-D elements a fresh dimension – juggling every discipline with palpable pleasure. Post Typography’s graphic design makes substantial use of lettering – whether in posters, illustrations or CD covers – and assiduously avoids typographic neutrality. Thus, hidden on their website is the manifesto “Typography is dead. You have killed it.” Together with an accomplice, Nolen and Bruce also make up punk rock band Double Dagger, feeding both their graphic output (they make all their own CD covers) and Baltimore’s famed music scene. They teach graphic design and typography at the Maryland Institute College of Art, and regularly contribute to conferences and exhibitions on the discipline. They recently curated the exhibition Alphabet.